She’s Picture Perfect also has a light, pinkish-purple shimmer, while most of my other colors like this are plain cremes. It was hard to capture the shimmer in my pictures, but it did actually show up in normal wear, more than some of the Essie shimmer colors. It gave a slight pearly sheen to the lavender that was really pretty. The formula was okay, but I felt like I needed three coats to make sure the color wasn’t streaky. I wore this color for at least a week and it didn’t chip at all, which is better than I’ve done with some Essies. You can see the shimmer a bit better in this picture – it made the color just a bit lighter and more springy. I compared to Zoya’s Caitlin, another lavender-ish polish from last year’s spring collection. In the picture below She’s Picture Perfect is on my index and middle fingers and Caitlin is on my ring and pinky fingers. Caitlin is a good bit darker and has more grey, and also is a straight creme with no shimmer. She’s Picture Perfect has a delicate, lighter feel and is still nice and muted, not too white or bright like some springtime lavenders can be. I really liked She’s Picture Perfect. 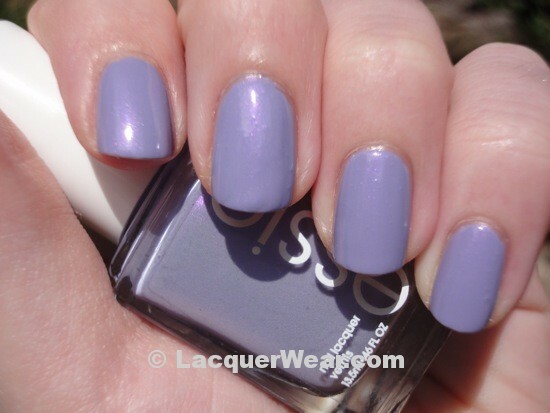 This polish is from Essie’s Resort 2012 Collection, which is out at salons and also retail stores like Walgreens and Target.